I've shared tutorials on the blog previously about how to screen print with Silhouette vinyl...but I get a lot of questions about "why would I screen print rather than use heat transfer vinyl or a freezer paper stencil." So today I thought I'd answer that question, because it is a good one! I should start off by saying I love screen printing, freezer paper stencils and heat transfer vinyl, but each has its own advantages and disadvantages. When screen printing with Silhouette you cut a vinyl stencil, place it on a screen and use a squeegee to push an even layer of paint over a screen and onto the surface below. It's then set with heat. One of the biggest advantages of screen printing is that after applying the vinyl stencil to the screen, that same screen and stencil can be used several times to quick make multiple copies of the screen print. It's a very fast and inexpensive way to create t-shirts or canvas bags, for example. To make multiple t-shirts or bags with heat transfer vinyl, a separate HTV design would need to be cut and individually applied to each surface. Screen printing also has its advantages over freezer paper stencils. Freezer paper stencils result in a similar look to screen printing since both use paint. However, the big advantage screen printing has over freezer paper stencils is, again, repeated use. Freezer paper stencils are applied with heat to the surface, but once painted, they are peeled away from and can't be re-used. Screen printing has been gaining a lot of popularity with Silhouette crafters - but there's not a whole lot of information out there! That's why I decided it was worth a book...at least a mini guide. So....I'm happy to announce the release of my 9th book in The Ultimate Silhouette Guide series - and the sixth mini guide. 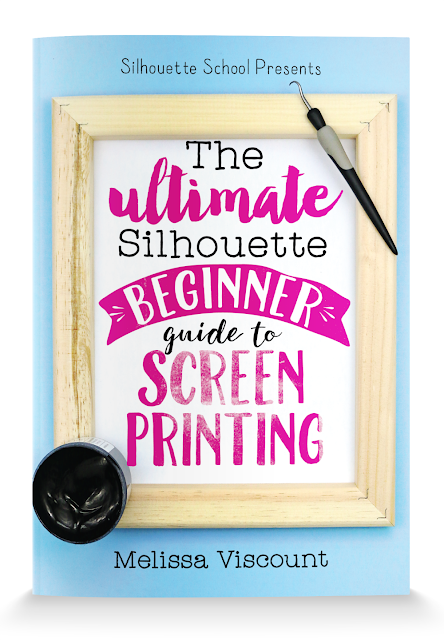 The Ultimate Silhouette Beginner Guide to Screen Printing is a 10 page guide that will walk you through screen printing step by step. 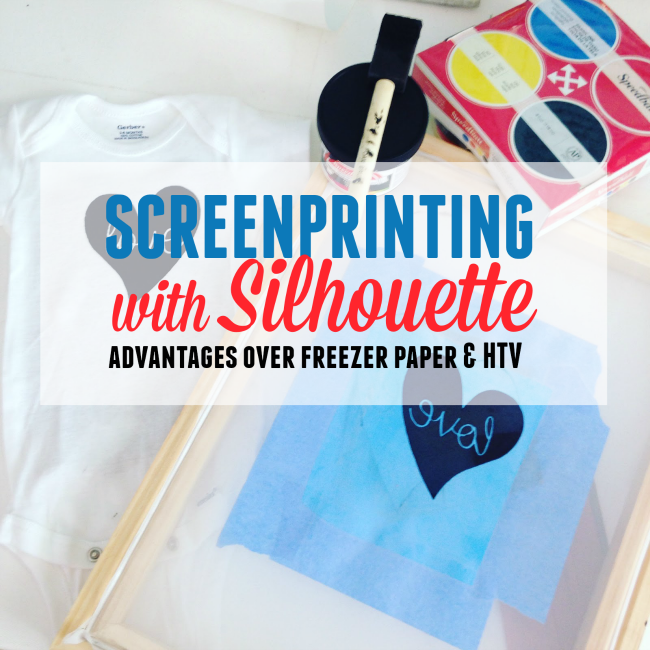 Plus I share the secret to multi-color screen printing with vinyl and Silhouette! One of the biggest challenges with screen printing with Silhouette and vinyl is the ability to use more than one color paint in a single design - but I'm thrilled to tell you I have perfected the process. The Ultimate Silhouette Beginner Guide to Screen Printing will also teach you how to properly clean your screen and troubleshoot common screen printing issues like paint bleed! The Ultimate Silhouette Beginner Guide to Screen Printing is available as both an instant digital download ebook as well as in paperback exclusively through Swing Design. I love HTV but I have never tried screen printing using my silhouette. I need to give it a try!! I would like to know how much in total for all your books for sale.